RadGreen is proud to partake in IBM Alpha Zone class #4. RadGreen will further develop it&apos;s cloud solution for the ongoing monitoring of the environment for organizations and Smart cities. RadGreen is taking part in Tyco innovation program that enhance innovative applications for better connected businesses, smarter commercial environment and safer cities. •	Many work environments pose health risks for employees. Whether there are labs filled with radiation emitting equipment involved, server rooms leaking electromagnetic radiation, or any other common source of potentially hazardous nature, organizations must do everything within their power in order to ensure their employees&apos; safety and well-being. RadGreen&apos;s systems effectiveness in monitoring work environments has been successfully tested and proven, assisting organizations to keep their employees safe and sound and providing executives and office holders with the much needed peace of mind. Providing excellent education is not enough. Having students enroll in your academic institution (be it kindergartens, schools, universities, or any other academic institution) puts their health in your hands. Labs, computer rooms, and a myriad of other facilities often emit hazardous radiation which puts your students&apos; well being in jeopardy when it comes to long term and continuous exposure. RadGreen&apos;s systems has been proven as an extremely effective solution to continuously monitor environments, immediately give notice when an irregularity is detected, and thus minimize students and staff exposure. Cities around the world whish to offer their residents and those who otherwise frequent their city the best and most up to date technological urban environment. Wi-Fi hotspots and coverage have become a necessary minimum to any self respecting modern city. However, such advanced services also entail putting residents in harm&apos;s way as more antennas are put up every day, enhancing radiation levels city wide. Where can the limit between sufficient Wi-Fi coverage and acceptable radiation levels be found? RadGreen&apos;s systems reliably and effectively provide city officials with continuous monitoring and documentation as to monitored parameters levels anywhere necessary, allowing them the peace of mind that comes with knowing everything is under control and the opportunity to let residents know how much their safety and health means to them. Different types of radiation are not all RadGreen can monitor for you. Modern life provides ample pollutants which endanger peoples&apos; health and well being. Spanning parameters such as air pollution as well as many others such as noise, temperature, humidity, gasses, and a wide range of other hazardous substances, RadGreen&apos;s systems offer a consolidated monitoring system. 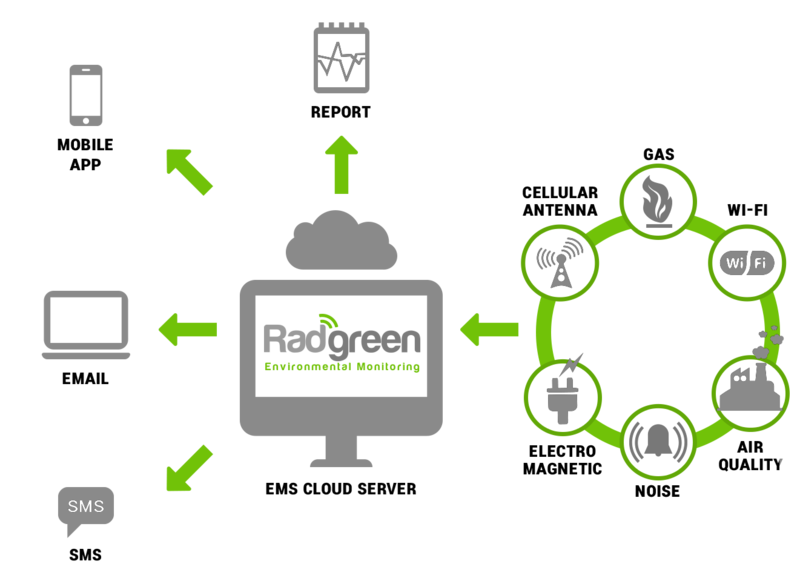 With a single, easy to use, and reliable IoT (Internet of Things) system to monitor everything worth monitoring RadGreen makes the need to install, maintain, and master various systems redundant. RadGreen - immediate knowledge allows for swift action.